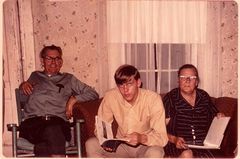 A collection of family pictures of Wiley & Earnie (LAWSON) Lloyd, and others. I want to thank Mrs. Theresa (LLOYD) Botts for allowing me to scan these pictures. 2-Wiley and Ernie LAWSON Lloyd. 22-Fayola Lloyd and Marsha Sexton. 25-Elidee DAVIDSON Lloyd and Ray D.
31-William Lawson - Which One. 53-Edith (Somebody) and an Unknown. 55-Edith, Minnie, and Curtis Lawson. 62-One of them is Edith Lawson. 64-Unknown, and Earl James Murley. 68-Unknown - Can you identify him? 69-Unknown - Can you identify them? 70-Unknown - Can you identify him? 71-Unknown - Can you identify her? 72-Unknown - Can you identify him? 73-Unknown - Can you identify her? 74-Unknown - Can you identify them? 77-Unknown - Can you identify them? 78-Unknown - Can you identify them? 79-Unknown - Can you identify them?. 80-Unknown - Can you identify her? 81-Unknown - Can you identify them? 82-Unknown - Can you identify them? 83-Unknown - Can you identify her? 84-Unknown - Can you identify him? 85-Unknown - Can you identify them? 86-Unknown - Can you identify them? 87-Unknown - Can you identify them? 88-Unknown - Can you identify her? 89-Unknown - Can you identify them? 90-Unknown - Can you identify them? 91-Unknown - Can you identify him? 92-Unknown - Can you identify them? 93-Unknown - Can you identify them? 94-Unknown - Can you identify her? 95-Unknown - Can you identify them? 96-Unknown - Can you identify them? 97-Unknown - Can you identify him? 98-Unknown - Can you identify him? 99-Unknown - Can you identify them? 100-Unknown - Can you identify him? 101-Unknown - Can you identify them? 102-Unknown - Can you identify them? 103-Unknown - Can you identify? 104-Unknown - Can you identify him? 105-Unknown - Can you identify them? 106-Unknown - Can you identify them? 107-Unknown - Can you identify them? 108-Unknown - Can you identify her? 109-Unknown - Can you identify them? 110-Unknown - Can you identify them? 111-Unknown - Can you identify him? 112-Unknown - Can you identify him? 115-Unknown - Can you identify them? 116-Unknown - Can you identify them?